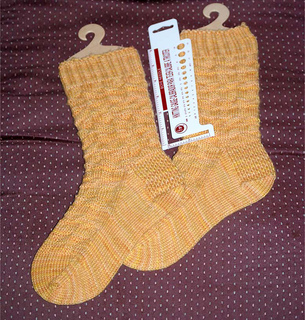 This sock pattern was designed for Iron Knitter 2, which is themed around the AMC television series “Mad Men”. Out of Town in London Fog is a tip of the hat to the first episode in Season 3. This sock pattern is top-down but can easily be converted to toe-up. The stitch pattern is easy-to-memorize. There are two sizes included in this pattern – women’s medium and men’s medium. Out of Town in London Fog can be done in a single color, or in 2 colors by using one color for the knit stitches and one color for the purl stitches.